Power from Syngas Syngas, also known as synthesis gas, synthetic gas or producer gas, can be produced from a variety of different materials that contain carbon. These can include biomass, plastics, coal, municipal waste or similar materials. Historically town gas was used to provide a gas supply to many residences in Europe and other industrialised countries in the early 20th Century. Syngas is created by the gasification or pyrolysis of carbonaceous materials. Gasification involves subjecting these materials to high temperatures, in the controlled presence of oxygen with only limited combustion to provide thermal energy to sustain the reaction. 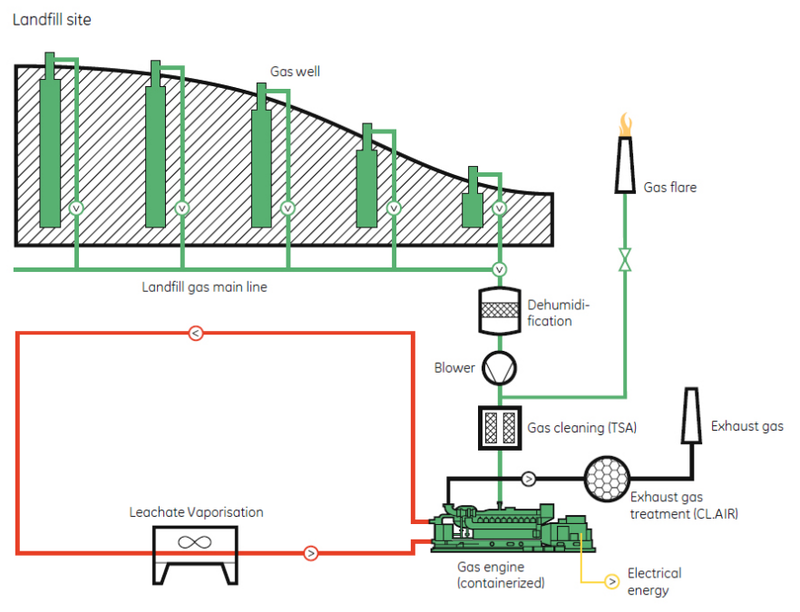 Gasification can occur in man-made vessels, or alternatively could be conducted in-situ as in the gas of underground coal gasification. 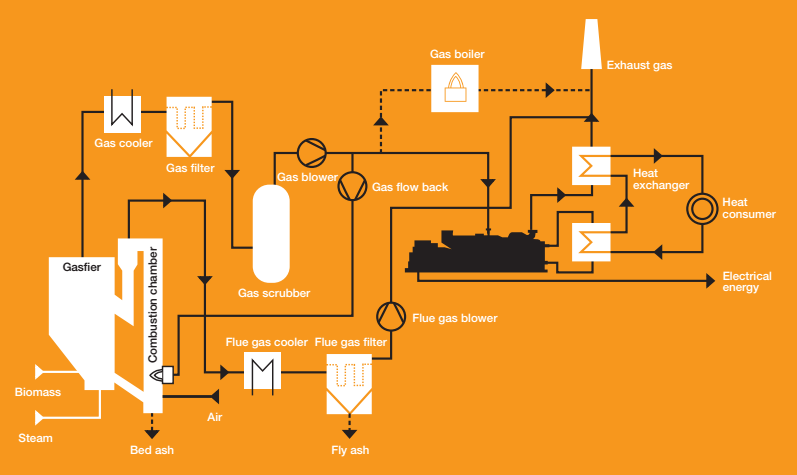 Where the fuel to the gasifier is of recent biological origin, such as wood or organic waste, the gas produced by the gasifier is considered to be renewable and so is the power produced by its combustion. When the fuel to the gasifier is a waste stream, its conversion to power in this manner has the combined benefit of the conversion of this waste into useful products. Benefits of Synthetic Gas — Generation of renewable power — Conversion of problematic wastes to useful fuels — Economical onsite power production and reduced transmission losses — Reduction in carbon emissions Syngas Challenges Steel production processes typically dispose large volumes of speciality gases. Three different process stages – from coal to steel – provide three different gas types: coke gas, blast furnace gas and converter gas. The composition of syngas is highly dependent upon the inputs to the gasifier. A number of the components of syngas cause challenges which must be addressed at the outset, including tars, hydrogen levels and moisture. Hydrogen gas is much quicker to burn than methane, which is the normal energy source for gas engines. Under normal circumstances, faster combustion in the engine cylinders would lead to the potential of pre-ignition, knocking and engine backfiring. In order to counter this challenge the engine has a number of technical modifications and the output of the engine is reduced to between 50-70% of its typically natural gas output. (I.e. a 1,063kW engine running on natural gas is comparable to a maximum 730kW engine on synthetic gas). Power from Steel Production Gas High levels of power requirement and rising energy costs represent a major challenge for the steel industry. Gases created as a ‘free’ by-product during steel production processes serve as an attractive energy source option for efficient power generation. In addition to the economic benefit, using these gases as engine fuel reduced industrial CO2 emissions and saves natural energy sources. 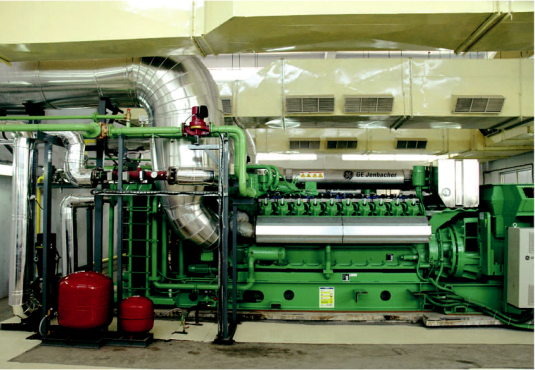 Benefits of Power from Steel Production Gas — Higher revenues from the utilisation of steel production gas as a fuel — Reduced carbon emissions — Stable robust onsite power supply — Heat from engines can be used in other processes Different Gases from Steel Production Processes Steel production processes typically dispose large volumes of speciality gases. Three different process stages – from coal to steel – provide three different gas types: coke gas, blast furnace gas and converter gas. Coke Gas A by-product of industrial coke production from pit coal, coke gas is created by high-temperature dry distillation of coking coals in the absence of oxygen. The gas mainly consists of hydrogen (50-60%), methane (15-50%) and a small percentage of carbon monoxide, carbon and nitrogen. With a calorific value of 5kWh/Nm3, coke gas constitutes a high-value fuel for effective power generation with GE Jenbacher gas engines Blast Furnace Gas Blast furnace gas is a by-product of blast furnaces where iron ore is reduced with coke into metallic (pig) iron. The gas has a very low heating value of around 0.9kWh/Nm3, which on its own is typically not high enough for combustion in a gas engine. There is the possibility to blend this gas with other off gases; you should contact your local Clarke Energy office to discuss this in more depth. Coal Gas Coal mine degasification was originally developed to improve worker safety. The methane, if not captured, is usually vented to the atmosphere through the use of exhaust fans. The potential danger to the environment through mines gas and its main constituent methane (CH4, 25-60%) can be reduced significantly considering methane has a global warming potential (GWP) 21 times that of CO2. Coal Seam Gas (CSG) Coal Seam Gas (CSG) is the type of gas collected from un-mined coal beds. CSG consists of over 90% methane and can be harvested independently of coal mining in some locations. The gas composition is normally stable, meaning that the gas can be fed directly into the natural gas network or a gas engine. 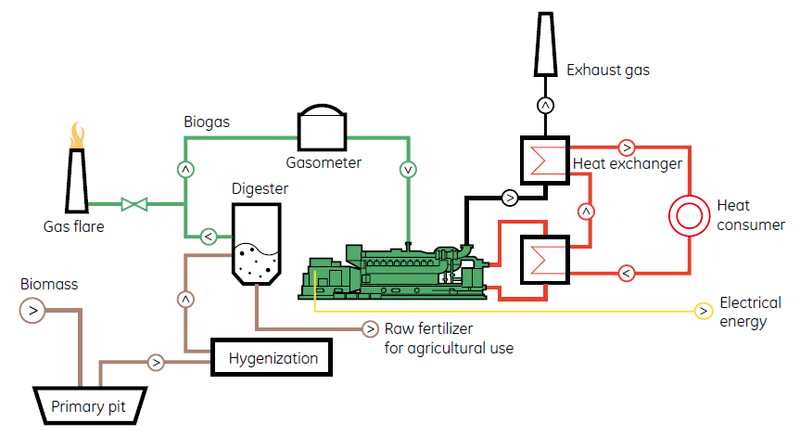 Agricultural Biogas The farming industry offers a range of potential applications for agricultural biogas systems. Arable land can be used to grow crops which are fed into dedicated digestion systems. Alternatively waste products from the farm can be harnessed to provide renewable energy. Agricultural digestion systems are typically sized between 0.5 and 3.0MW electrical output. 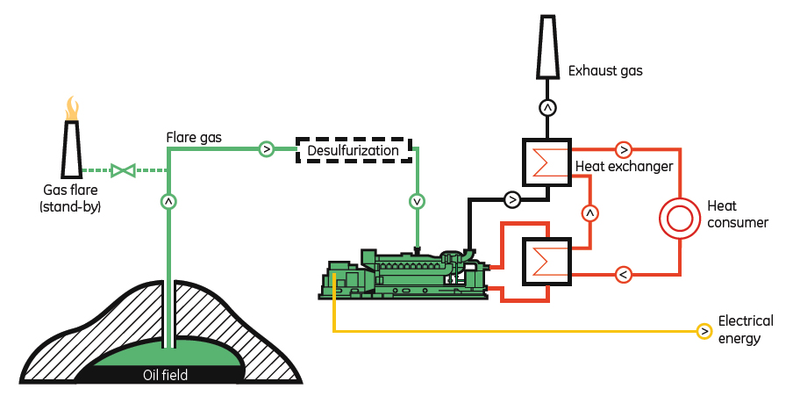 The heat produced by the engines is typically used in a cogeneration/ combined heat and power (CHP) configuration with heat from the engine cooling systems used to warm the digesters and pasteurise input materials. Additional heat is available from the engines to be used for local heat users such as grain driers or for district heating. Benefits of Agricultural Biogas — Production of renewable power — Avoidance of greenhouse gas emissions — Disposal of waste — Economical onsite power and reduced transmission losses — Production of soil improver — Cost effective, proven technology — Helps isolate farmer from crop price fluctuations Benefits of Agricultural Biogas Biogas is a renewable fuel that is created by the anaerobic decomposition of biodegradable organic materials. As a metabolic product of the participating methanogens and acidogenic bacteria, the prerequisites for its production are a lack of oxygen, a pH value from 6.5 to 7.5 and a constant temperature of 35-45 °C (mesophillic) or 45-55 °C (thermophilic). The digestion period or retention time is typically between 10 and 30 days depending upon the type of digestion employed. 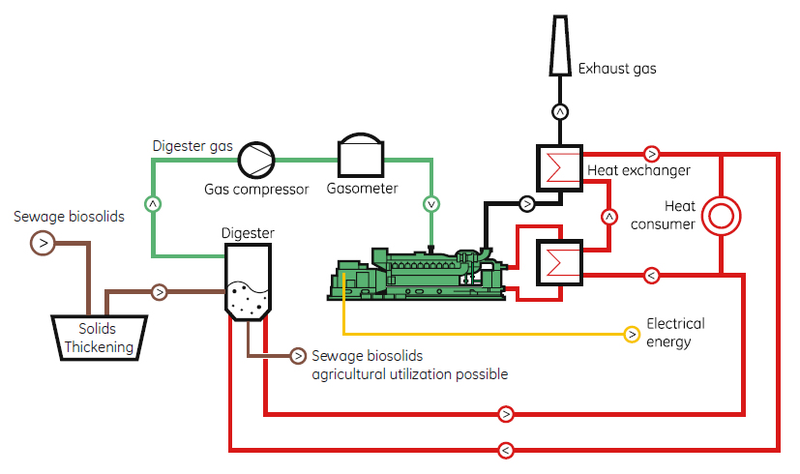 The anaerobic digestion systems of today operate largely within the mesophilic temperature range. 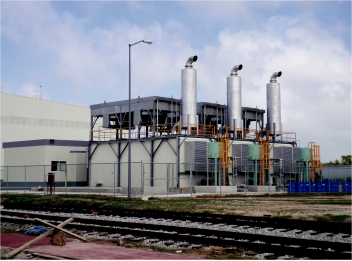 Landfill Gas Landfill gas is created during the anaerobic decomposition of organic substances in municipal solid waste (MSW), commercial and industrial (C&I) wastes and other biodegradable waste streams. Depending upon the landfill design and its management, as well as waste composition, compaction, moisture and several other factors, thousands of landfills are available worldwide to collect and utilise this valuable renewable energy source for power generation. If landfill gas is allowed to escape to atmosphere, methane contained within it is a powerful greenhouse gas, 21times more so than carbon dioxide. Therefore, its prevention of escape to atmosphere and its utilisation as a renewable fuel source is a win-win situation. Benefits of Landfill Gas Power — Production of renewable power — Avoidance of greenhouse gas emissions — Cost effective, proven technology Landfill Gas Collection For a landfill restoration that prevents greenhouse gas from migrating into the atmosphere while avoiding offensive smells and smouldering fires, the gas must be continuously extracted under controlled conditions. Perforated tubes are drilled into the landfill body and interconnected by a pipework system. Using a blower, the gas is sucked from the landfill. A well-designed gas collection system will flexibly capture the gas from various spots and handle high temperatures, leachate, condensates and air content – thus ensuring a cost-efficient collection as well as stable gas quality. Several engineering companies specialise in this field and offer their services on a worldwide basis. Copyright © 2015-2019 XIAMEN GTL POWER SYSTEM CO.,LTD.